Ballingrud’s fiction is an amalgamation of some of the best elements of current dark fiction. The stories of North American Lake Monsters are poetic and literary (think Kelly Link or Caitlin Kiernan), forbidding and nihilistic (think John Langan), very real and raw (think Nic Pizzolatto), while also scaring the bejesus out of you (think Laird Barron). Ballingrud’s 2015 novella The Visible Filth was filmed as Wounds, directed by Babak Anvari and originally scheduled for release March 29; it does not currently have a release date. 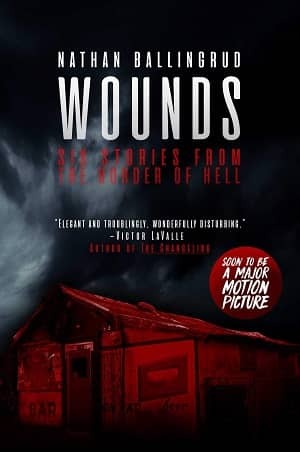 Next month Saga Press is releasing a brand new hardcover collection of Ballingrud’s horror stories, Wounds: Six Stories from the Border of Hell, which includes The Visible Filth, the acclaimed “Skullpocket” (which James called “an absolutely amazing story. It offers humor, sadness, and sheer creepiness throughout” in his review of Nightmare Carnival, 2014), a brand new novella, and three other stories. Here’s the description. A gripping collection of six stories of terror — including the novella The Visible Filth, the basis for the upcoming major motion picture — by Shirley Jackson Award–winning author Nathan Ballingrud, hailed as a major new voice by Jeff VanderMeer, Paul Tremblay, and Carmen Maria Machado — “one of the most heavyweight horror authors out there” (The Verge). In his first collection, North American Lake Monsters, Nathan Ballingrud carved out a distinctly singular place in American fiction with his “piercing and merciless” (Toronto Globe and Mail) portrayals of the monsters that haunt our lives — both real and imagined: “What Nathan Ballingrud does in North American Lake Monsters is to reinvigorate the horror tradition” (Los Angeles Review of Books). Now, in Wounds, Ballingrud follows up with an even more confounding, strange, and utterly entrancing collection of six stories, including one new novella. From the eerie dread descending upon a New Orleans dive bartender after a cell phone is left behind in a rollicking bar fight in The Visible Filth to the search for the map of hell in “The Butcher’s Table,” Ballingrud’s beautifully crafted stories are riveting in their quietly terrifying depictions of the murky line between the known and the unknown. 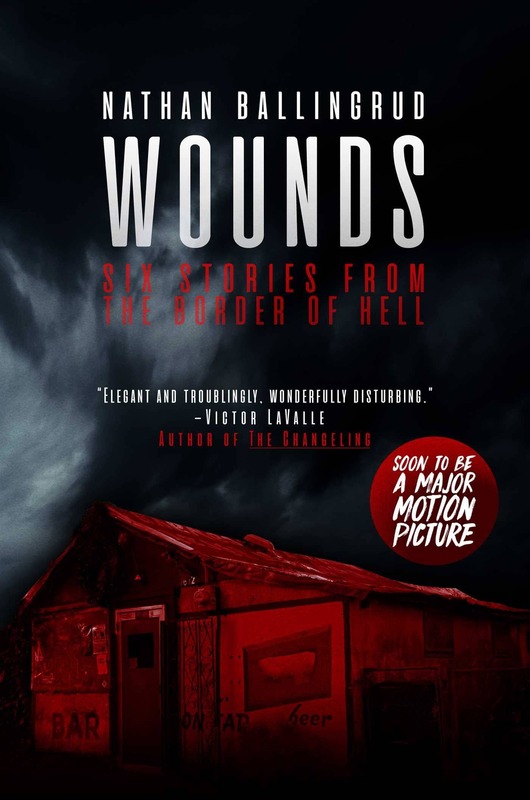 Wounds: Six Stories from the Border of Hell will be released by Saga Press on April 9. It is 275 pages, priced at $26.99 in hardcover, $15.99 in trade paperback, and $7.99 in digital formats. See all our recent coverage of the best in upcoming fantasy here. Ballingrud doesn’t put out a whole lot of material on a regular basis. Looking forward to reading this. It showed up in the mail. I had no idea it was coming out. Very nice surprise!